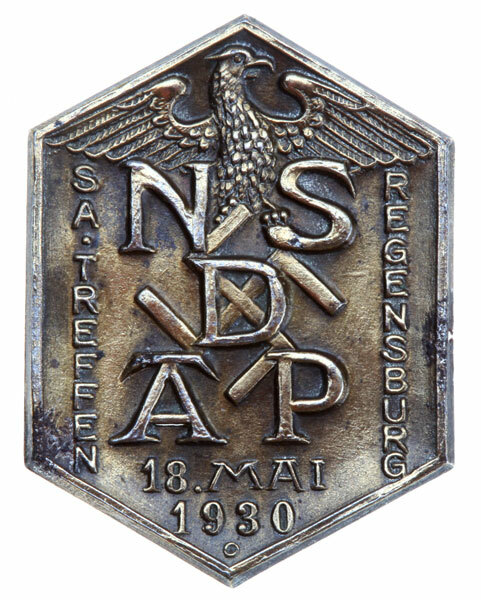 SA & NSDAP Treffen Regensburg 1930: In response to some Catholic priests declaring Catholics could not become members of the NSDAP, party members and the local SA attended services on May 18 1930 in the Cathedral of Regensburg bringing in their flags, standardts, and banners. The press throuout Germany reported the event with sensational headlines like "Swastikas in the Cathederal"! 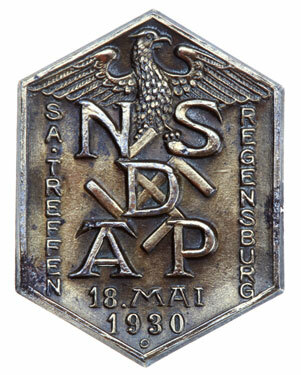 This badge just surfaced to verify the party probably planned for the SA to embarass the Church. 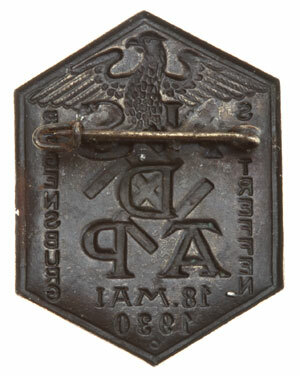 Bronze plated steel, 35 x 26 mm, early struggle-time tinnie, unlisted in Tieste, rare!, light to moderate wear.